Jean-Luc Godard’s first feature still looks like it’s breaking a whole lot of rules 40 years on. Basically it’s a classic chase movie. The action is set off when a young hood Michel Poiccard (his alias is Laszlo Kovacs – in tribute to the great cinematographer of the same name), who adores Humphrey Bogart (the screen persona, that is), kills a cop and goes on the run with a young American girl, the iconic Patricia Franchini, played by Jean Seberg. 26-year-old Jean-Paul Belmondo’s performance as the hood marks the real beginning to an extraordinary career as the biggest French star since Jean Gabin. Godard made the film for the equivalent of 100,000 Australian dollars and dedicated it to Monogram Pictures as a tribute to cheap American gangster movies of his own youth – films that seemed to young auteurs like Jean-Luc to offer so much more than the more elegant, well wrought and polite studio products of France of the ’40s and ’50s. Breathless was instantly hailed as a truly revolutionary movie and the logical outcome of the French New Wave (Nouvelle Vague) rejection of what they called ‘Le Cinema de Papa’ (Dad’s Cinema). The most patently radical Godardian style was the incessant use of the jump cut, a sudden temporal ellipsis even in the middle of a dialogue take. That’s standard practice now but at the time it broke every dictate of the conventional filmmaking manual. In fact this technique was a little more accidental than political. The film, loosely (with a minimal and constantly changing shooting script) based on a ‘crim on the run’ storyline by François Truffaut, ended up as a rough cut of around two hours long – more the length of the despised blockbusters then and now. To be considered a commercial product the movie needed to lose about 30 minutes, so rather than cut out whole scenes or sequences, Godard elected to trim within the scene, creating the jagged cutting style still so beloved of action filmmakers. Godard just went at the film with the scissors, cutting out anything he thought boring and as a result the whole movie does indeed feel rather ‘breathless’, each scene seeming to rush jerkily to a finish, with barely enough time to make full sense. Who would have ever guessed that what is now a cinematic cliché (at its most excessive in the late ’60s and the ’70s) could have had so practical a raison d’etre? The film also vibrates with onscreen references to popular culture and the affects of the media in ways that anticipate later theorists of the postmodern. It draws, albeit unconsciously, on Marshall McLuhan’s contemporary ideas on the ‘Global Village’ and Roland Barthes’ work on the dominance of culturally produced signs in society. Belmondo’s character is literally obsessed with Bogart’s poster and screen persona, and constantly checks out his style against cinema posters of ‘Bogey’ as well as imitating his gestures in numerous mirrors. Belmondo is excellent, and classically existential (rather like Mersault in Camus’ The Outsider) as the feckless young hood who steals a car, kills a motorbike cop, and chases after some money that is owed him for robberies past so he and his casually picked up yank chick (Seberg with a cropped head look that became existential de rigeur for years) can get to Italy. He’s always, like Pierrot le fou (also played by Belmondo) in Godard’s 1965 movie, dreaming of the Last Score and the big escape to that foreign, safer land. There’s always a mythical, semi-mystical Other, Better Place in Godard’s earlier movies. Godard probably lives there now. Other cultural references and film in-jokes swarm throughout Breathless: admired cult stylist, the film director Jean-Pierre Melville, appears as a celebrity novelist being interviewed; Daniel Boulanger appears as the police inspector. Jean-Louis Richard and Philippe de Broca appear, and there are also bit appearances by Godard, as an informer, by Truffaut, and Chabrol (who also acted as supervising producer). And of course there are many legends about the actual shoot including the use of wheelchairs as camera dollies. Renowned cinematographer Raoul Coutard’s legendary ability in hand holding heavy 35mm cameras in long takes also comes to the fore. Coutard’s amazing work, predating Garret Brown’s invention of Steadicam, can be seen at its best in Jean Rouch’s short contribution to the compilation film Paris Vu Par (1965). This begins with a hand-held shot that traverses many rooms, an elevator, and street, and runs for a full 20 minutes! Finally there was the matter of the film stock which was in fact painstakingly hand-joined rolls of a very fast Ilford black and white still camera stock along with short ends of other stocks. This produced the grainy ‘naturalistic’ effect that Ken Russell – and later just about everyone else – was to borrow for his social ‘realist’ documentaries. 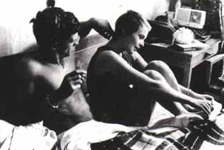 Just about everything that looks different about Breathless became the signifiers of alternative, radical, independent film almost immediately. Nothing, until Reservoir Dogs (Quentin Tarantino, 1992) came along three decades later, ever quite shook up film style as much as Breathless did in 1960. Perhaps no movie will ever break the ‘rules’ so effectively and so influentially again.